Let me (Cherry) review products of Albion Excia AL Whitening Mini-bottles Set. 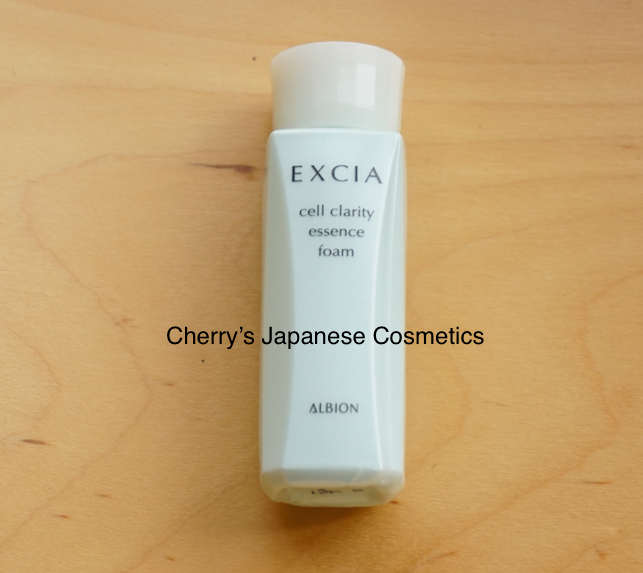 In this time, I will show you Excia AL Cell Clarity Essence Foam, the face wash. This is new for SS2017, took over Excia AL Whitening Circulating Essence Foam. It is not a lotion/ toner, this is a face wash. !? This is a transparent liquid, and I doubted again whether I opened the lotion bottle or not. Oh, this is the truly “foam”. I add drops of water and try to make a bubble. It was super easy to make enough bubble to wash. For me, this bubble is enough, but I guess you will feel “light” bubble. I know there are many people who like “rich” or “creamy” foam. In person, especially at summer, I do not want to use “rich” or “creamy” face washes. All I need is letting me feel “fresh”. No worries, there are no peppermint or something sting to make feel “cool”. Just I felt “fresh”. For me, this is a good product. But I guess when I would have felt my skin was too dry, I could not have used it. The perfume is nothing to write. I care the scent of cosmetics, but for me, it was acceptable. Totally to say, they are the people who I do not recommend this face wash: super dry skin, preferring”rich” “creamy” bubbles, moist your skin with face washes. They are the those who I recommend this face wash: normal-oily skin, preferring to feel “fresh” with face washes. Cherry felt there are nothing so much different from the previous formula of Circulating Essence Foam. Here is a review by Hazelnuts, for circulating essence foam. I was surprised when I saw how watery this was, because I’m used to facial wash (cream) and bar soaps. Consistency was very fluid and the lather was very soft and light. When I rinsed it off, my skin felt moist. Although it was good and it didn’t cause me breakouts, the watery consistency is not my preference. I still like cream-based washes or facial soaps because I like the creamy abundant lather that makes my skin feel squeaky clean, probably because I have oily/combination skin.